Our next big move (we have some smaller ones, of course) is to do the downstairs framing. Yesterday we came up with a plan to make a new hiding place in case of Nazi invasion (this is what old people use as bugaboos instead of zombies, and you kids get off of my lawn! ), and today we spent some time testing how that would work with like, actual measurements. Have I mentioned how worth it the laser level purchase was? Totally, totally worth it. The thing is not cheap (I think a decent one runs about $1000) but we have used it for every project since buying it, and it has been worth every penny. Plus I sometimes use it for work. Noel set it up to see where the wall will end up being, which we know will be slightly off of where the wall used to be, of course. That's where the bathroom wall will be. 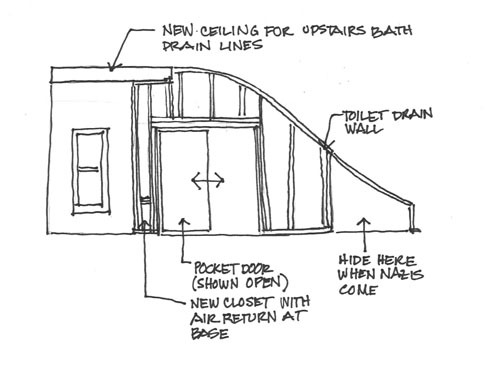 We're going to keep the curved ceiling in the bathroom (I need to figure out how to get our vent fan/light combination up in there, but I'll figure something out somehow), and leave the curve outside the bathroom, so we won't lose that awesome feature. Yesterday's discussion was all about whether we could fit the pocket door in without taking out some of that framing. Lest you think we just harsh on the most recent previous owners, let me tell you that the framing for this wall, as non-structural as it is, is some of the most jackass framing in the house, and it was done by the original builders. Anyway, it soon became clear that while we could frame the pocket door without removing that wall, the door opening would be right next to the toilet, which is kind of uncomfortable. 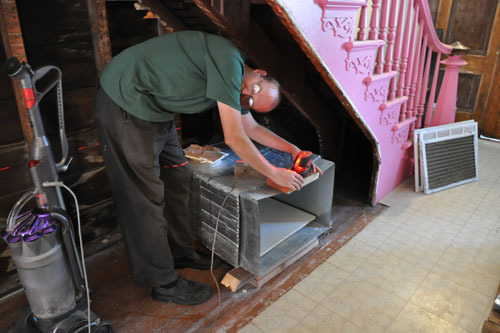 But we wanted to do that so we could move the furnace air return over to the bottom of the closet (so the closet would be raised, basically), and have our little hidey-hole. But if we rotated the air return 90 degrees so it faced into the back hall, everything worked OK. The air return is juuuust the right size to take up the whole bottom of the closet (the door of the closet is not going to cover the return, don't worry; we are not completely high here). We can cut off the existing wall and frame the pocket door into the new hallway-side wall, and still have our hidey-hole. 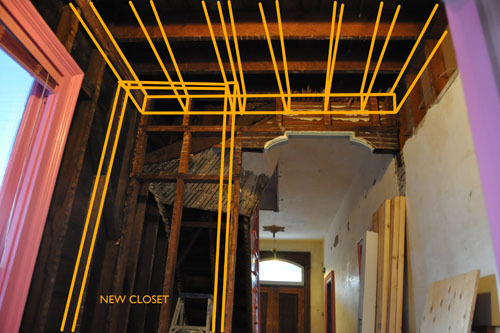 We haven't talked much about the new closet, but it's one of the aspects of this project that I am most excited about. We'll have a coat closet and then cupboards above to store things we don't use as often. When we decided to move the third bathroom here I was most bummed about losing a coat closet, not that ours was so great, and fitting this one in makes me so happy. I do worry that it makes our back hall a little small, but it's a hallway, not a room. 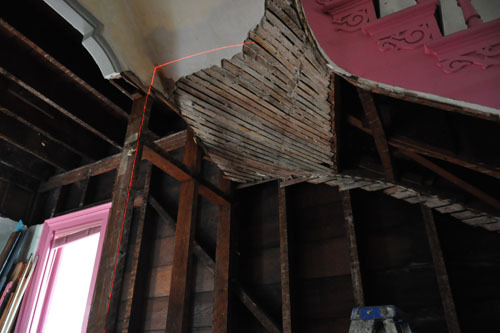 We're framing a new ceiling under the old as support for the joists. Over the years they've been ravaged by a series of plumbing changes. We needed to support them somehow. Then I had this great idea to use linear drains upstairs, and if we built a new ceiling, I could cut into those same poor joists to sink the drain running along the outside wall. We're still in discussions about this, mainly trying to work out what will look the least bizarre and also be easy to actually do. I'm not convinced that lowering the ceiling in the back hall by 8 inches is going to be a problem, and maybe half of what we're doing is just flailing. But it's worth spending the time and being sure that what you're doing is right before you start building.